Dry, dull skin. Brittle brows. Limp hair. Who needs it? As a professional beauty writer, and a beauty content provider, I’ve discovered some of the latest and greatest ways you can look over-the-top radiant every day no matter the season. Add these goodies, and this advice, to your get-gorgeous beauty arsenal! Winter hair color is inspired by nature – caramel and chocolate colors, and golden blonde tones, says Mr. Cassano. With cold weather’s rough skin, brittle eyelashes and sparse brows, Ms. Beck recommends La Mer The Eye Concentrate to reduce crow’s feet and fine lines, and Smashbox Photo Finish Lash Primer. “It’s a must to help brittle lashes,” says Ms. Beck. Mr. Cassano’s hair studio also offers not only lash extensions, but eyebrow extensions – a fabulous new alternative. This is a remarkable, innovative new way to have beautiful brows like all of the top models right now. Bushier brows are, indeed, just one way to make your entire face more beautiful. One of the biggest beauty problems in spring is dull hair, says Mr. Cassano, who recommends color, highlights, hair masques, and balayage – a French method of lowlights and highlights painted onto the hair. Voila! The biggest problem for summer hair? Humidity. Counteract frizz and limp waves with Coppola Keratin treatments, says Mr. Cassano. The spectacular straight results last about four months. And since updos are so popular for summer, Mr. Cassano recommends 100% human hair extensions to make hair longer and easier to pin up. And remember, braids are all the rage! Summer skincare can also be problematic. 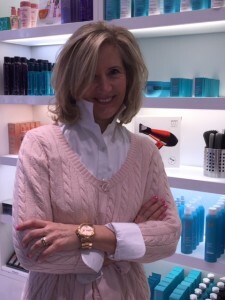 Ms. Beck advises using primers that absorb oil, such as Hourglass SPF 15 Veil Mineral Primer. “Eye and face makeup for summer should be light yet long-lasting,” she says, citing Chanel Joues Contraste Powder Blushes and Nars velvet shadow sticks and eye paints. No matter the weather, these beautifiers can take years off your looks and make you appear more radiant and youthful – and refreshed. What if you have facial lines and wrinkles lines that need extra TLC? Dr. Michael Yaremchuk, a Yale-educated plastic surgeon who is Clinical Professor of Surgery at Harvard Medical School, recommends Botox or Xeomin injections in his Boston office as a smart way to achieve a youthful, rejuvenated look. I personally experienced a facial rejuvenation from Dr. Yaremchuk (read that post here) and it was amazing. The Xeomin injection took years off of my face. I was thrilled with Dr Yaremchuk’s results. He is definitely one of Boston’s best plastic surgeons. Make sure to watch his videos on his website, to see his patients who are completely satisfied and pleased with their natural-looking results. Now go out there and set the world on fire — and look dazzling while doing it!